Introducing the Mini Monster Truck. This fantastic RC is 1:52 scale making it small enough to fit on the palm of your hand. 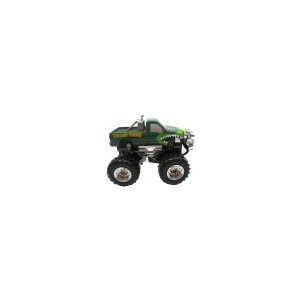 Featuring full function radio control you'll be able to go in any direction just like a real Truck. You can even drive the RC in the dark thanks to the working headlights and tail lights. The detailed paint job replicates the British Monster Truck. Because the Mini Truck charges off the transmitter, all you need is 4 AA batteries and you're good to go!